The adventure of reading lasts a lifetime, and parents have the opportunity to launch that journey at home with their children. Snuggling up in a reading nook at home with your children and an engaging book can create a child’s lifetime love of learning and a platform for success. Amidst the busy, distracted lives we live, developing a love for reading and prioritizing it in our routines with our kids can pay off in the long run. Why not make reading a part of every bedtime routine? Or, develop the habit of reading each night after dinner. Reading aloud to our kids strengthens their vocabulary, reading comprehension, and imagination. Reading not only boasts academic benefits like early reading preparedness and higher reading comprehension rates, but also has bonding benefits due to the snuggle factor we can enjoy with our kids while we read. Face it, you can only see a book’s words and illustrations if you are in proximity, so snuggle up on your favorite couch, chair, bean bag seat, or bedside, and read on! What do we communicate to our children when we take time to read to them daily? We’re saying—with our actions—“I love and value you; you’re special, and spending time with you is important to me.” The adventure of reading can be dramatically enhanced by a parent’s intentional use of an engaging, animated voice and sincere enthusiasm. These elements make up the priceless moments spent together in the beauty and discovery only books can bring. Let there be rhythm. There’s a rhythm to reading that engages children and helps expand their attention. Find the rhythm that gives your children ample opportunity for reading comprehension and enjoyment. Let there be inquiries. 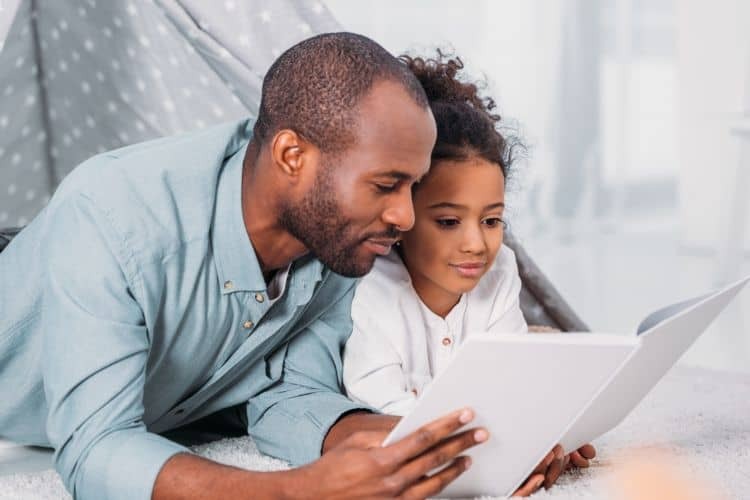 As you read to your child, they will begin to associate or correlate the content of the book with other things you’ve read together, or people you know, animals you have seen, places you’ve been, and so on. Take time to allow the inquisitive inquiries of your children to launch meaningful conversation within the read aloud time you spend together. Let there be choices. Children are as different as their fingerprints, and each of them are endowed with unique talents. Often you will spot their strengths and talents in the choices they make while they play, and the books they gravitate toward when given a variety from which to choose. So, get a library card for each child, and visit the library often. Encourage your children to pick out books they want to read to themselves, or read together. And while you’re at the library, enjoy story hour together as you observe another adult’s rhythm and expression as they read to children in a group setting. Let there be repetition. The favorite books in your home library may get picked repeatedly by your children when they are given a choice about what they’d like you to read to them. And while variety in reading content is important, so is repetition. Let there be opportunity. As children grow up and learn to read themselves, give them the opportunity to read during your daily reading time. If they happen to mispronounce a word, then self-correct, offer sincere encouragement. If they mispronounce something and keep reading, take the time to point to the word, say it for your child, and allow them to echo your pronunciation. Let there be anticipation. Sometimes it’s fun to pause before turning a book’s page and inquire what your child thinks may happen next. Keep your time together engaging, and stay focused during the precious moments you spend together reading. Model how fun the reading adventure is as you participate in storytelling throughout your reading time together. Let there be creativity. Reading feeds a child’s imagination, so read on and stir up the creativity within your children. You inspire imagination and broaden your children’s vocabulary while reading aloud to them. Let there be confidence. Read aloud to your children, and when it’s time, have your children do the reading to you. Reading builds confidence in your kids. There’s nothing quite as enriching as sharing a book together, so elevate your children’s self-assurance by reading together. Read Smart, the reading center in Tulsa, offers coaching for pre-K-6th grade students. Typical results include students advancing a grade level in 3-4 months of one-on-one tutoring. Get a free reading evaluation today!